Our accurate diagnostics find the slightest leak or problem in your exhaust system so we can keep you and your passengers safe from toxic fumes as well as maintain your vehicle’s best fuel efficiency. We also test for and repair emissions so you stay current on state regulations. Accurate wheel alignment requires the right skilled technicians and the right technology. Our facility has the most up-to-date technology and the well-trained mechanics to deliver precision wheel alignment in Portland. Stay safe, get the most from your tires, and increase fuel efficiency with Wheel Alignment. Our friendly, knowledgeable staff listen to your needs and driving habits to help you select the right tires for your vehicle. As a full-service tire shop, we sell, install, repair, rotate, and align tires. Come see our affordable and comprehensive selection of tires in Portland. 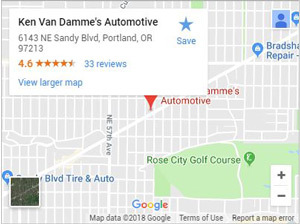 Looking for car repair in Portland? Look no further! Since 1968 we have been building relationships with customers by giving them and their car or truck the one-on-one attention they deserve. Ken’s nearly 50 years of experience in the automotive repair business have brought forth a desire to create a different kind of car repair to Portland. We deliver a higher level of proficiency with accurate diagnostics and honest, reliable repairs. We care about developing trust! Since 1995, we have consistently provided the best car repair service and strived for the satisfaction of our customers. We are an auto repair shop that cares about quality and has expertise in all aspects of car repair, including engine repair and clutch repair. Our expertise is combined with a dedication to excellent customer care. We happily answer any questions you have and take the time to go over the details of our inspection with you. We offer an honest, straightforward estimate with no hidden fees and no erroneous suggestions, then wait for your approval before doing any work. Those are just a few of the reasons we have a strong reputation as the go-to auto shop Portlanders can trust. Why choose our car repair services? We use the latest in diagnostic technology to get your car on the road safely and quickly. Come in our auto shop for preventative maintenance today. We are ASE Certified, AAA approved, and a NAPA AutoCare Center! We say this not to boast of accolades, but to demonstrate that we go the extra mile in securing professional associations and certifications that attest to our depth of knowledge and credibility. You deserve to feel confident in the car repair receive, wherever you go.